Welcome to the Pres Ban Journal. A curated travel log by film maker Andy Elliott. My new short travel film Meandering Myanmar is now live! Check it out below. After spending 3 weeks shooting in Myanmar and the best part of 2 weeks editing this video, I wanted to share with you 5 things that make a compelling travel video, as well as some Behind The Scenes. These look phenomenal in any edit. They create pace, motion and intrigue and are a perfect way to step up your travel video. How do you shoot one? Simple. Don't use a tripod, your traveling and you don't have time for it. Find one spot on your subject that you can see throughout your chosen path (back/forth and sideways work best). In the above hyperlapse of Sulamani temple I chose the tip of the roof. Remember to keep it simple, let the scene do the work. Choose a straight line. Then point, shoot, step repeat. Manual settings prevent flickering in post. I shoot raw, edit in Lightroom, export as jpegs and then open sequence in TimeLapse Assembler I then use Warp Stabilizer in Premiere Pro to smooth it out. 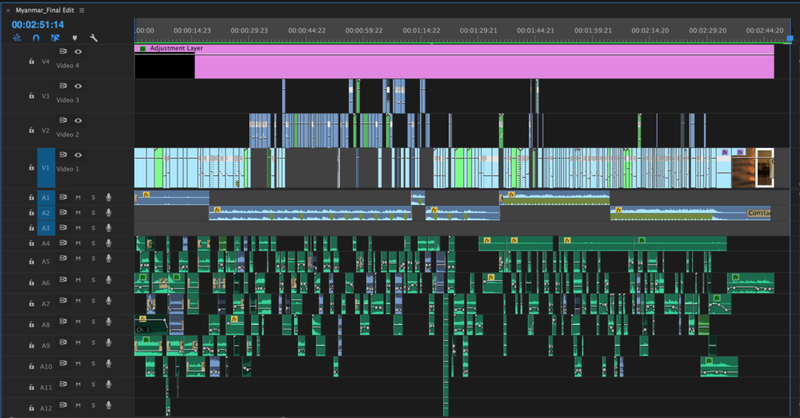 Meandering Myanmar Timeline - Layering audio really helps bring your film to life. Capture that sound when it happens on a good mic and you’re golden in post. Using a hand field recorder is a must for capturing authentic sound. I have to admit that I didn’t have my audio gear running when I was filming and had to add layers in post and source from websites like freesound.org to bring the edit to life. In the temples for instance, If I had fired up my Zoom H6 field recorder, I would have had high quality audio from the origin. A simple hotshot video mic like those from Rode are also great. Anything other than the terrible onboard DSLR mics. The music is essential for your film. Spend some time searching and getting a short list together. I typically look for something that has emotion at the beginning and ramps up to something more intense and climactic at the end. I chose Ludovico Einaudi's piano piece 'Ora' for Meandering Myanmar and edited the track from its nearly 7 minutes so it would work. It's a beautiful piece of music and It pairs really well to the cinematic landscape of Myanmar. Sound design in post is crucial your video. If you have'nt done so already, start building a library of SFX like whooshes, orchestral hits, and ambient sounds, then layer them up in your edit so they make sense with what is going on visually. I must have over a hundred wind sounds. Free Sound Project is a great source I use for sounds, 100% free. Have an idea in mind before you shoot. Think of the edit and how it might fit with shots you already have in the can, or shots you will want to get after this one. Also, think logistics. If you have a sunrise timelapse to get to, how will you get there, will you have a driver or rent a bike? Do you know which way East/West is? In Bagan, where I shot 4 days of sunrise and sunsets, my iPhone compass app came in very useful. iPhone shot of the main temple area of Bagan. The sunrise from Shwesandaw Pagoda was mesmerising. Camera Whips /Camera Movement - static shots i can’t use 50% of the time because they’re boring (unless it's a timelapse). What is exciting is being able to string several clips together that all have something in common so that I can create motion within the edit. Find your shot, say a temple, and whip your camera from behind a dark wall, or from the sky. Then hold on your subject for a second then whip away to the side or into something dark. Then in the edit you can start to piece together the clips that flow in the same direction, or match in the same kind of movement. Watchtowers of Turkey is a great example of how to create flow within your edit with this kind of camera movement. When you are editing you can use the Time-Remapping tool to speed ramp your shots. I usually speed up the beginning then go into slow motion when the action is happening, then speed up the tail end which helps blend it into the next shot. I try and do this to the music as it can really make your edit flow nicely. My best advice on shooting while traveling is to pack light. Tripods are useful but they can be cumbersome to lug around. Handy Tip - When filming, try using a camera strap. Put the strap up around your neck and pull away from you. This tension stabilises your camera - perfect! This was great for busy places like the markets in Yangon and the Shwedagon Pagoda. Film everything thats interesting to you. Be curious. Talk to people. Take their portrait in slow motion. Take a rusty bus somewhere. Take people up on their offer to show you around, you'll never know where you might end up! Me and my girlfriend rented an E-Bike around Bagan and got lost in the abundance of temples. We also rented a scooter in Mandalay which was incredible, its a real adventure when you don't know where your going. We even went to the second tallest buddha in the world at Monywa on a sketchy bus crammed with people. Maha Bodhi Tahtaung in Monywa. The second largest buddha in the world. If you haven't been to Myanmar I highly recommend it. My eyes haven't been the same since. So there you have it, 5 Things that really make a compelling travel film. Thanks for reading the PresBanJournal, I hope you found this useful and insightful. Do you any favourite travel shooting tips? Post it in the comments below!